I've been making smoothies since sometime last year. It was a way to add Emma's breakfast variety of breakfast other than oatmeal or pancakes. Since then, I've trying trying out different kind of smoothies including healthy green smoothies. Here's a nice an easy one that I whipped up on a Sunday afternoon. 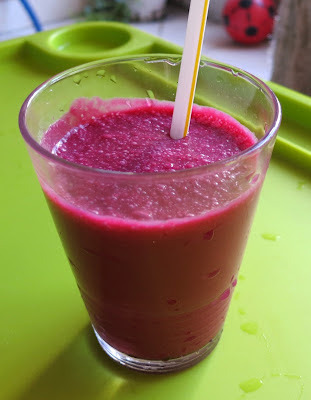 I used cooked beetroots and chocolate malt powder. Do give this a try. It's not only pretty but also delicious.